David has always been skilled at draughtsmanship and during his early career was employed in industry producing diagrams of complex machinery. This required great patience and attention to detail. It was a talent that came quite naturally to him. However, with the onset of draughting machines he could see redundancy looming and developed a hobby he already had restoring ceramics into a full time occupation, soon gaining a considerable reputation in this field. 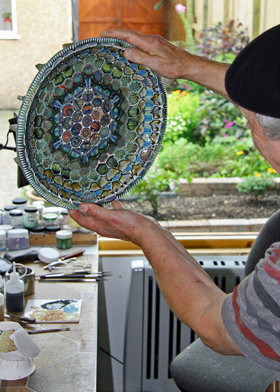 Following many years of research into technique, he was able to recreate large pieces of damaged art pottery or whole tiles from pieces by artists such as William De Morgan, the Martin Brothers and William Moorcroft. In the 1980s,through his fine modelling of a hand on a piece of early Meissen porcelain he was invited to try sculpting for the industry, taking to it quite naturally. Although making 'one off' porcelain objects is very different from factory bone china manufacture, it gave David a first glimpse into mould making, casting, firing and all the myriad skills of ceramic making. This is not where the story ends. 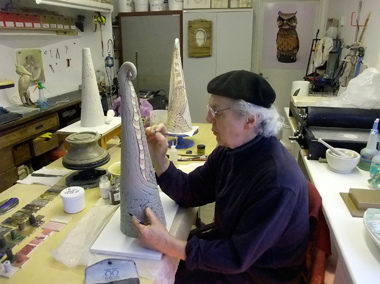 David has discovered in himself (perhaps later in life than he would have liked) a talent for creativity in ceramics and a distinctive style. His inspiration comes from history, nature, spirituality and, of course, inspiration is drawn from the whole history of the ceramic world. He strives to create ever more complex and demanding works of art either in shape, composition or decoration. This inevitably means that for every two successful pieces there is likely to be one that did not survive. David uses mainly porcelain and his work is often fired at temperatures close to 1300°C. Great care has to be taken over the rate of heating and cooling in the kiln. When mistakes do occur it is often a very painful experience as much creativity and workmanship can be lost forever. Yet, he is philosophical about this and accepts the risks involved. When a perfect piece is fired without error there is nothing more thrilling for him than taking it from the kiln clean and bright with fresh colours that will never fade. The risks involved and sacrifices he has made are undoubtedly worthwhile.